Psychopaths can be spotted quickly if you pay close attention. 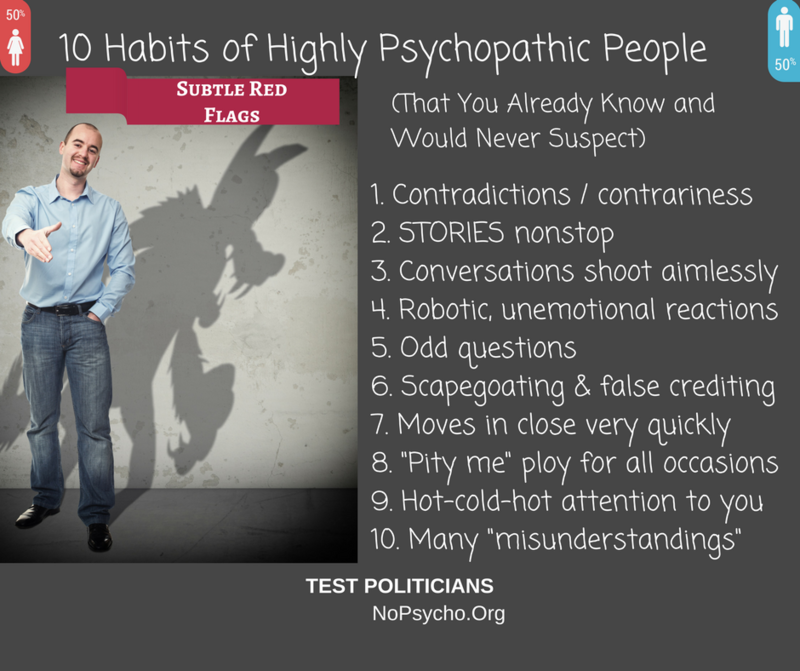 Please share this handy reference card for identifying psychopaths in your midst. At 4 percent of the population, there are 12 million in the US alone. Psychopathy is a neurological disorder that makes them extremely self-serving, with little empathy and no conscience. This means that they will take advantage of you to no end. Learn to spot them and protect yourselves from their scams. View a Ted Ed Lesson: "What is a Psychopath/Sociopath?" WHY DO PSYCHOPATHS NEED TO BE IDENTIFIED? Pathological lying, scapegoating, bullying, and the WIN at all costs mentality are signs of psychopathy, and these people are the ones who do not serve the people, only themselves. Psychopaths are in both parties - they are often known as obstructionists. A prime example of psychopathic behavior is when the GOP leadership denied vetting of their secret tax plan in December 2017. A character like Jim Jones at the helm leads the unknowing flock into antisocial behaviors. This is why it is so important to open your eyes to their defective neurology, and keep them out of government. The danger of this malignant narcissism is that their lack of conscience causes them to act against societal norms; breaking vows, pulling scams, and using people with no remorse. They make their own rules. A society in the hands of psychopaths brings misery to the citizens and harm to the environment. Psychopaths in government are responsible for the genocidal policies that allow corporations to wreak havoc on society, as well as the laws that blatantly disregard the Constitution. Their void of conscience means they can NEVER be trusted. They are neurologically unlimited in their capacity to betray people, damage the environment, and create worldwide havoc – without any care at all. They cannot be shamed into working for the people, they will always carry through with their own agenda, regardless of the consequences! And, in addition to the unintentional collateral damage, there are some (Dark Tetrad) who are sadistic and secretly enjoy causing strife. Would You Consider a Gift to Help Fund Our Project?